Like many parents of a child with autism, we were distressed to hear of the poor treatment a little boy and his mother received in a Michigan salon. This CNN article is our response to the incident, and will hopefully provide some tips for members of the public on how to better respond when they see a child becoming upset. 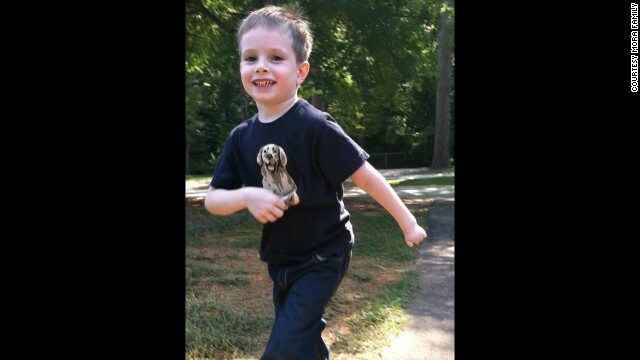 Writer Bridget Mora's 5-year-old son, Holden, is one of an estimated 1-in-88 children in the United States who has autism. Editor's note: Bridget Mora is the mother of a 5 ½-year-old son with an autism spectrum disorder. A resident of Chapel Hill, North Carolina, she is a member of the board of the Autism Society of North Carolina Orange Chatham Chapter. She also blogs about autism. (CNN) -- Ashley Bays took her toddler into M Spa Salon in Portage, Michigan, for a simple haircut but left with a "severe tongue lashing," according to a witness whose Facebook post about the event went viral. Customer Vanessa Hunt wrote about her outrage at watching salon owner Michelle Mott allegedly dress down Bays and 2 ½-year-old Grayson because the child cried during his haircut. "At the conclusion of this woman's tantrum to the mother the mother said through tears, 'I'm so sorry, he's autistic,'" Hunt wrote in a post that has been shared more than 35,000 times. Attorneys for the salon said in a statement to mlive.com that Mott reacted reasonably to safety concerns caused by the boy's behavior. Many toddlers cry during a visit to the hair salon, but the experience can be particularly challenging for individuals with the sensory sensitivities that are common in autism. I know, because my son is one of them. Haircuts require a patient stylist, a special list of instructions, books to read and a fresh shirt to change into immediately afterward. If it weren't for the promise of a lollipop at the end of the haircut, he might not go into the salon at all. The noise and feel of the clippers can be painful, the smells of dyes and permanents overpowering, the water sprayed on their hair upsetting and the sound of hair dryers panic-inducing. However, Bays, a longtime client of the salon, had found one hairstylist she trusted to cut her son's hair -- no small thing, as parents of children with autism can attest. The incident at M Spa Salon has brought a much larger issue to the public eye than merely the allegedly nasty behavior of one business owner: Parents of children on the autism spectrum struggle with public judgment on a daily basis. Sometimes kids with autism exhibit behaviors that draw attention to themselves, ranging from self-soothing repetitive motions to a full-blown meltdown in an overwhelming situation. The reaction of the bystanders can go a long way toward defusing panic or exacerbating it, which is what happened when Mott reportedly yelled at Ashley and Grayson Bays until they both left the salon in tears. "I've never experienced anything else like this before. I understand if she doesn't want children in the salon, but she could have handled it a lot differently. She could have pulled us to the side. She was very insensitive that he does have special needs," Bays later said. Just as a negative reaction can make matters worse, thoughtful words and actions can help. The hairstylist who joined the family outside to complete the child's haircut stands out as an unsung hero in the unfortunate M Spa Salon drama. Another recent example was the kindness of a waitress at a Chili's Bar and Grill in Utah who replaced the "broken" hamburger of an autistic girl without batting an eyelash. Small kindnesses can go a long way. So what should a person do if they witness a child with autism (or frankly any child) in distress? According to Amanda Benson, LCSW, an autism specialist at The University of North Carolina TEACCH Autism Program, the most useful thing that bystanders can do is ask the parents: "Is there something I can do to make this easier for you?" "The parents will know what will best help their child," Benson said, such as dimming the lights, moving to a quieter space or offering a preferred toy as a distraction. In the specific case of a haircut, the child might be more comfortable with scissors only or conversely only with clippers. Because autism encompasses such a broad spectrum, there is no single solution that will work well for all individuals. Bystanders should refrain from judgment. Effective parenting techniques are different for children with autism than for typically developing kids. Because attention is often a strong behavioral reinforcement for individuals on the spectrum, parents may strategically ignore inappropriate behaviors, while providing positive reinforcement for appropriate behavior. Bystanders can help by offering an empathetic smile for the parent or a word of praise for a child who is trying his best. Some parents of autistic children carry small cards to hand out explaining autism to strangers who stop and stare, or sneer. Without acceptance of the whole spectrum of human development, people with disabilities are inevitably excluded from society. Given that the Centers for Disease Control and Prevention estimates the autism prevalence in the United States to be 1 in 88 (and more recent studies suggest that figure may be as high as 1 in 50), business owners are going to have to become better educated about how to serve individuals with special needs. Not only are they their customers, as in the case of the young Grayson, but people with autism are entitled to the same access to public spaces afforded all other Americans.